Escape into Beaujolais wine country and the Dombes lake region on a full-day private culinary and wine adventure from Lyons. Uncover the area’s reputation for wonderful foods and wines, and browse the food market at Châtillon-sur-Chalaronne, set in a 15th-century covered marketplace. 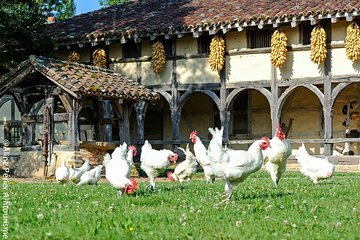 Savor lunch (own expense) in Bresse, with the chance to sample some succulent meats and poultry, and finish at a traditional, family-run winery to learn about its winemaking and sample some delectable, fruity wines. Price is per vehicle, based on a maximum of seven people. Lyon hotels or the surrounding area.